My life has taken a turn for the better since I met my trainer Alex Zuniga. I hadn’t worked out in over 14 years. It was negatively affecting all aspects of my life from my energy level to my attitude and overall health. Alex has motivated me and showed me that I could change all these things if I dedicated myself to working out and living a healthy life style. When I started working out with Alex three and a half months ago, I could hardly do a lunge or squat my own body weight! Now I feel strong and determined. Alex is very encouraging and processional. He is not just my trainer, he’s also become my friend. My reward? I have lost 20 lbs so far and feel great! I decided to get myself into training again after a holiday with family in the UK left me feeling decidedly unfit. After no training for about 10 years caused by a general laziness, I set about walking myself fitter. Although this was working to some degree, more was required. I was using the gym one day when I met Alex, who was training one of his clients. We had a chat and I booked some sessions for my wife and myself. In the first session Alex spent time building up a picture of my health and wellbeing history, and the goals I wished to achieve. He also took measurements of my height, weight, BMI and fat % and then proceeded to inform me not to get to caught up in the numbers (great advice). Alex also prepared a nutritional plan for me, and a training regime: twice a week with him one on one, three times on my own and a group session (Boot Camp) on Saturdays. I have been training with Alex for the past four months and my weight has dropped, as well as my BMI and fat% and my waist is 10” smaller. The important thing though is that I feel much better and fitter in myself. The lessons have continually evolved and are fresh, exciting and challenging. His instruction about technique and form has ensured that I haven’t injured myself. As with all goals, mine have changed as I have become fitter and I imagine will continue to do so. I appreciate the time and effort that Alex has put into the training, ensuring I don’t get bored and lose interest. I have been happily married for 16 years. In this time, I have been working a full time career with a busy travel schedule to different states, being a full-time mother of two, a head coach for a cheerleading squad, a baseball mom, always eating on the go and I have been EXHAUSTED! Sound familiar? I never had the time to work out, or made the time. 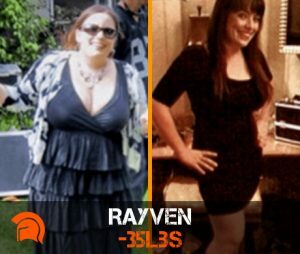 At 37 years old, 230 lbs, I was the heaviest I have ever been! It was spiraling out of control. I tried every weight-loss diet there was over the years, and I could never lose more than 15 lbs. The diets were never sustainable, so I would quit! I could never do it on my own. I sat at my desk and watched Alex train his clients for about 1 year. I could not believe how amazing Alex’s clients looked in just a short period of time! I could not sit and make excuses for myself any longer. I remember thinking, how was I going to fit workouts in with my busy schedule? I sat down with Alex, and he created a diet plan and workout schedule that worked with my “on the go” lifestyle. Alex has taught me to make healthy choices, including what foods I should eat and how to prepare my meals ahead of time. The best thing is I eat all day long! The workouts are fun and educational, and I find myself anxiously waiting for my next work out. My energy level has increased dramatically, which has helped with my long days. I feel myself looking more fit and feeling much stronger in such a short period of time. 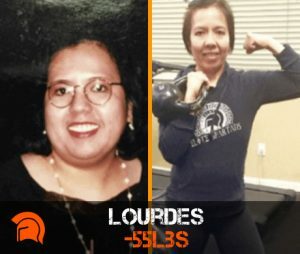 I started my weight-loss journey with Alex 3 ½ months ago, and I have already lost 37 lbs.! My goal is to lose a total of 70 lbs. I know Alex is the guy to take me there! I have always struggled with my weight since I was a teenager. Standing only at 5’0″ tall, my weight ranged from 125 lbs – 160 lbs. With years of yo-yo dieting and yo-yo exercising, I gained more weight than I could have ever imagined. My heaviest was at 180 lbs. It was only in 2012 that I had a wake-up call. I was not in the best of health and to make matters worse, I hurt my lower back. I got so tired of being sick and the way I looked that I decided to do something about it. I came across Alex at the gym while he was training Rayven, who was another client. She only had good things to say about him, but I was still not 100% convinced. I asked myself how his workout program set himself apart from the other trainers, specifically how he worked with back problems. He may be able to ‘talk the talk’, but can he also ‘walk the walk’? Alex tailored the workout according to my goals and needs. If we were working on my abs, for example, and the exercise causes pain in my back, he would show me different options but the routine was still for the abs. Alex is very detail oriented in that he would take the time to show and explain the exercise even if it meant going over the allotted time. I am amazed that with only the use of certain tools such as the Kettle Bell, Bosu Ball, and Medicine Ball, Alex’s workout program really works. My body has more definition and shape and my energy level has increased. And the best thing is I no longer experience the back pain that I used to ! When I first decided to start training, I wanted to lose weight so that I could feel better about myself. 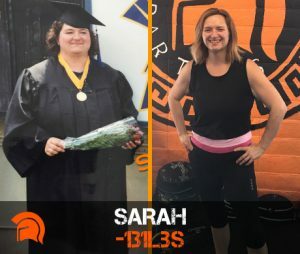 Now that I have been training for a while it’s more than losing weight; it has become about maintaining a healthy life, challenging myself, and living an active lifestyle. My initial goal was to lose 30 pounds by my 30th birthday and I gave myself 1 year to accomplish that goal. When I first started training, I was really weak and really sore. As I continued to train I could see and feel my improvements. I got stronger, my reps increased, and I felt better about myself mentally and physically. I changed my diet but believe me, I wasn’t always prefect about following the diet. But that’s why this program works: it practical. However, I dropped 35 pounds in 5 months so I met my goal quicker than I thought possible. Although I have reached my goal, my goals now have shifted. I am focusing on losing 15 more pounds and toning up by getting more muscle definition. I have come a long ways since I started training. Not only have I lost weight, I feel better, and I have more energy. My life has changed since I began training because I really enjoy working out. I enjoy challenging myself to train harder and to get in even better shape. Getting a personal trainer has been the best thing I have done for myself because I have lost weight and I have had fun doing it. Having a trainer allows you to want to continue to train because you are always doing something different and you are constantly being challenged. Alex is an amazing trainer. He is knowledgeable, flexible with scheduling and most importantly he enjoys what he does. Not only is he my trainer, but he is my friend as well. I would recommend Alex to anyone and everyone because he cares about his clients; he wants them to succeed, and most of all he is really good at what he does. Six years ago, I was about to turn 40, and my body was clearly telling me that it was time to get some help. 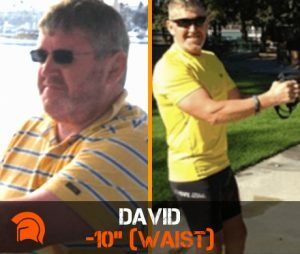 I had been severely overweight for many years and managed to lose about 90 pounds when I went to Weight Watchers. But I had given birth to two children (2008 and 2010) and some of the weight had come back. I am also somewhat of a couch potato by nature, and I was in a very serious car accident as a teenager. Ten years ago, I developed severe tendinitis in both my arms and a very painful back problem and it took years of physical therapy to get things to a point that I can live with. However, my back was starting to hurt more and more and my posture was terrible. I had started to exercise on my own but guess what happened? Yes, I injured myself even more because I didn’t know what I was doing. A friend of mine from work told me about Tammra at Elite Spartans. My friend also had a number of physical challenges, and she told me that some days, she was just working with Tammra on simple things such as getting off the floor after a fall because that was important and relevant to my friend’s health that day! I am like … what???? Personal trainers do stuff like that???? I thought they just get everyone ready for the next bodybuilder exhibition!!!! I thought about it for a little while and the next thing I did was the best thing I have ever done for myself, my health, my family, my future … I called Tammra! My schedule is very tight (full-time demanding job, two young children) but I was able to see her at lunchtime and we have kept up this schedule for six years now. I see Tammra twice a week and the progress I have made is nothing short of phenomenal. What makes Elite Spartans and Tammra so incredibly special? At Elite Spartans, everyone is genuinely friendly and supportive, and they really care about every single one of their clients. From the moment you walk in they are very professional and enthusiastic. They have the most advanced “toys” (functional equipment) to train you with and help you to achieve the results you want. Tammra is extremely qualified. 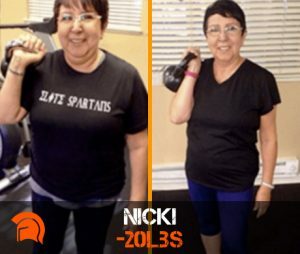 She creates personalized workouts based on YOUR needs. She is a master trainer and has many years of experience training people who deal with chronic illnesses and injuries. Every workout is different and capitalizes on a mix of cardio equipment – rowing machine, bike, treadmill, jump rope, and more. 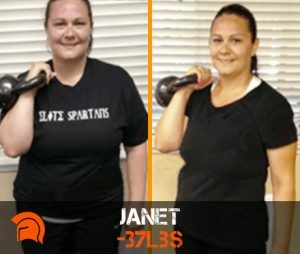 She uses a wide variety of kettle weights, dumbbells, bar weights and other goodies at Elite Spartans . And she mixes in functional exercises such as burpees, mountain climbers, and push-ups to keep things interesting. She is right next to you all the time closely paying attention to form and if something doesn’t work for you, she will come up with another exercise. I am 100% convinced that if I had never made that decision, I would be constantly in severe pain from my neck, elbow and pain problems. Unfortunately, these issues will never go away completely but Tammra has taught me how to manage them. My posture is sooooooo much better, I have muscle definition in my arms, and I have abs. It took time and patience to get there but I have an excellent quality of life. Since I see her twice a week at Elite Spartans, she catches issues as they flare up and we adjust exercises accordingly. Pushing through pain is NOT the way to go. If one of my injuries has flared up, she will modify my exercises. I am able to walk 10,000 steps a day on a regular basis and while my colleagues at work huff and puff up the stairs, I am not even breathing heavy. And oh by the way, I am now a steady 155 pounds down from 288!!! Tammra, thank you so much for everything you have done for me, I truly appreciate it.